Please refer to our stock # cet2 when inquiring. These gorgeous necklaces/belts were made by the Italian design duo of Lyda Toppo and Bruno Coppola, better known as Coppola e Toppo. 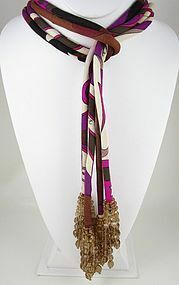 Each necklace/belt is 58" long and both are made from colorful Pucci print jersey with 3" ombre crystal tassels on each end. They can be worn as a lariat as shown or as a wrap belt. They are in excellent unworn condition and still retain their Neiman Marcus paper tags. These are priced individually at $300. Please request an invoice if ordering both.